To add grandeur to the charismatic Raksha Bandhan, order online these Pretty Kids Rakhi Gifts supplemented with a Fancy Rakhi, Roli Tilak and Chawal free of cost. 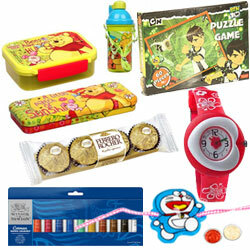 This Gift is comprised of a Zoop Kids Watch, Colour Set, Winnie-the-Pooh Tiffin Box, Sipper Bottle and Pencil Box Hamper, Toy and Chocolate (Ferrero Rocher 4 pcs. ).